When shipping in the colder winter months, shippers often will use a heat pack. 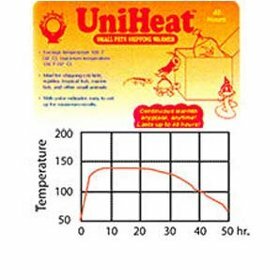 Most people assume the heat pack will keep fish a nice and even temperature in the box during shipping. 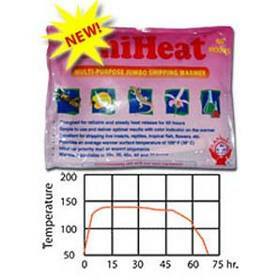 The reality is those heat packs get hot and peak at certain temps and last a fixed period of time. After a new shipment of heat packs cooked fish to two different customers I went looking for more info on these packs and this is what I found. 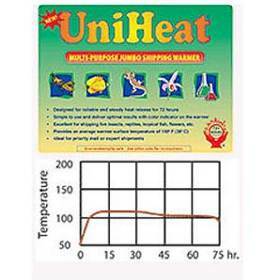 Most shippers use the UniHeat warmers. They come in various “hours” . I came across a neat web site that has some stats on the different warmers. As you can see, these little packs get termperatures up to at least 160 degrees. Even for express shipping, unless the temps are bitter cold when the fish are leaving my house, I will not use them. Duration is little more then 30 hours but effective time around the 24 hours mark. So on a two day ship your fish have intense heat and a rapid cooling. And what happens if the USPS loses your package? Nothing there to keep the fish from extreme weather. I do not like using these for any reason. These also get real hot real quick. Good if fish leaving in bitter cold. The packs have a more gradual cool down and the time frame is probably good for Express or Priority. 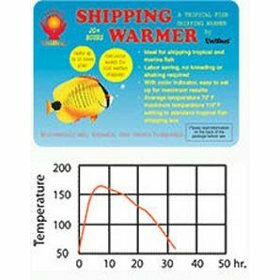 If the fish are lost in transit you have some residual warmth to keep them from experiencing no heat. Fish may be cold but still alive. Fish leaving from more moderate areas may use this pack. The initial temperature spike is not as hot as the other packs and remains fairly steady over a period of time. I prefer the gradual cooloing rather than a sharp decrease. Sudden chilling can bring on velvet in fish. Should keep fish good over a 2 day period with no issues.. and if shipping to warmer areas will not be so hot to cook the fish. I think many shippers use this heat pack. For Priority shipping, where the fish are in a box for 3 days, this is a little more heat pack. Again, the initial heat spike is not so hot and we have even temps kept over a period of 60 hours or 2.5 days. Drop off in warmth at the end is a bit steep but fish should be at their destination by then. These are actually my preferred heat packs. Reason being they do not get as hot as the other packs. And I ship from Texas so offsetting temps of bitter cold do not happen here. If they do we just wait a few days. I like the steady heat to offset outside temps over a period of 3 days. Hopefully even the post office can deliver in that period of time. With an Express shipment it gives a margin of error and for Priority it keeps the fish stead through the entire shipping time. Drawback to this pack is the weight. They are heavier and so add a little to the cost of shipping. But when you have live animals to ship, I think they are worth it. 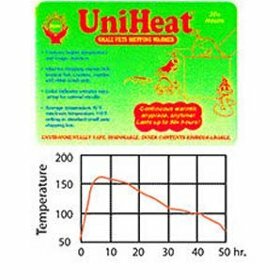 Please see the web site I got the charts from for more information on using these heat packs as well as instructions to use them correctly.